Overhand throwing places extremely high stresses on the shoulder. In throwing athletes, these high stresses are repeated many times and can lead to a wide range of overuse injuries. 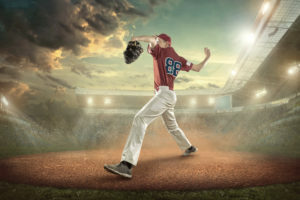 Although throwing injuries in the shoulder most commonly occur in baseball pitchers, such as Rockies’ pitcher Mike Dunn, they can be seen in athletes who participate in other sports that require repetitive overhand motions, such as tennis and volleyball. Read below for a news article on Mike Dunn’s experience and recovery from shoulder surgery. Dr. Schnell, CSO’s Board Certified Orthopedic Surgeon & Shoulder Specialist also weighs in on the story from his perspective. Can Rockies’ Mike Dunn, his shoulder finally pain free, bolster bullpen? SCOTTSDALE, Ariz. — Mike Dunn is the Rockies’ forgotten reliever, but a major cleanup of his ailing left shoulder could give a suspect bullpen a major boost. Dunn, 33, knew something was wrong with his shoulder. He was sure there was a reason for the pain that forced him to shut down in early July last season after pitching in just 25 games and being limited to 17 innings, with an ugly 9.00 ERA. What Dunn didn’t know was just how messed up his shoulder really was, until he underwent surgery near the end of the season. According to Dr. Schnell, treatment often includes physical therapy, injections, or minimally invasive arthroscopic procedures to widen the joint. “These treatments can be extremely effective in allowing the patient to return to normal activity,” says Dr. Schnell. “In cases where there is significant instability of the AC joint, complete reconstruction using synthetic internal bracing and soft tissue grafts are also an option. “For the first time in a long time, I’m able to throw with no pain,” Dunn said. “It was something where I really didn’t realize I was going through it. Surgery also included shaving down his collarbone to reduce friction. The results, Dunn said, have given his career a rebirth. Dunn has thrown nine bullpen sessions this winter and figures he’s about a week behind the rest of the relievers. He has no doubt he’ll be ready for opening day. “My arm feels free and easy again,” he said. Dunn signed a three-year, $19 million deal prior to the 2017 season and went 5-1 with a 4.47 ERA over 50 ⅓ innings in a club-high 68 appearances. He’ll make $7 million this season and the club holds a $6 million option on his contract next season, with a $1 million buyout. Original article published on The Denver Post. If you are experiencing shoulder pain, call the Center for Spine and Orthopedics at 303-287-2800 for an appointment with Dr. Schnell.